Bellamy’s was established in 2004 and is named after the club in Evelyn Waugh’s Sword of Honour trilogy. This reassures our English customers. Our French customers are amused by the happy pun with Bel Ami ; the novel by Guy de Maupassant. Everyone else comes for the food and the wine. 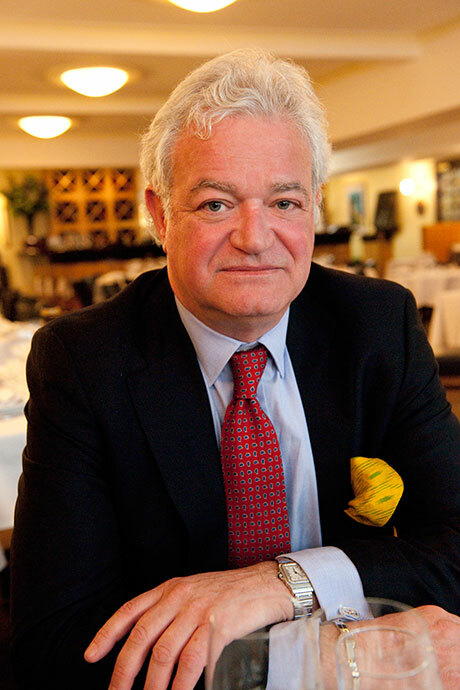 The management of Bellamy’s is made up of myself, Gavin Rankin (former Managing Director of the Annabel’s Group when under the chairmanship of Mark Birley); Chef Stéphane Pacoud (former second Chef at Annabel’s); and Manager Luigi Burgio (formerly Annabel’s barman). Here the intention is to adapt the best elements of the Franco-Belgian tradition of the brasserie. Except that Bellamy’s has less beer and rather more wine than was found in the original nineteenth century models. The design throughout is the love-child of the architect and designer Tim Flynn, who has spent some time in Paris researching brasserie decoration. His is a fresh version of the concept with no attempt at hiding behind retro-clichés or other obvious shortcuts. Reflecting my own prejudices, Bellamy’s has an unashamedly French wine list with familiar names at reasonable prices. There is also a weekly table d’hôte menu which, at £ 29.50 for three courses, appeals both to the cautious young and to the prudent mature who, as in all the best parties, are happily united here. We also have a day-time Oyster and Sandwich Bar; and an evening Cocktail Bar. Most of our customers are regulars and some of them have been kind enough to describe us as ‘a sort of club without a sub’. If that is so then membership is free and instantly open to all and, if you have not been to Bellamy’s, we hope that you will join us soon.